I often start reading books only never to finish them. If a book fails to capture my attention soon after I begin it, then I find it tough to read through the end, no matter how highly-recommended the book or author might be. It may be a style of writing issue, or maybe the subject just isn't that compelling, but during my recent move, I discarded many books (stacks of them) which I'd started but never finished and vowed not to do that again. Sure, I could go to the library, but often new books have waiting lists before they're available, and then when the book is available, you get a limited, 2-week time frame to finish it. I don't want that kind of pressure; I read for pleasure these days, and I'll be damned if I'm going to be forced to finish it by a specific deadline as I was in High School English class! Today, there are countless books on diabetes out there, but I must admit that I find most of them a bit like watching paint dry: they consist of spewing various treatment mantras and health tips or other so-called professional advice on coping (sometimes by people who have no genuine clue since they are diabetes "experts" who don't actually live with the disease themselves, or by patients who have come to terms with diabetes and believe their own "revolutionary" experience is universally applicable to everyone), but most of these books are basically dry, boring, uninspiring, and often missing a lot of current information I'd like to know about. 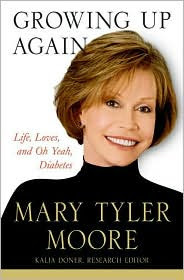 For these reasons, I was a bit leery of Mary Tyler Moore's new book, "Growing Up Again: Life, Loves, and Oh Yeah, Diabetes" for fear that I wouldn't like it and end up tossing it my ever-growing pile of started-but-unfinished books. However, considering the subject matter (and the fact that diabetes is featured prominently in this book, unlike MTM's autobiography "After All"), I decided to try it anyway, and was pleasantly surprised! Some reviewers have commented that the book does have a more casual writing style (more like blogging), and that it seemed like she wrote the book in a few days. I suppose those criticisms are also appropriate. Although I think Mary Tyler Moore may be doing some promotion for JDRF (all of the proceeds from the book are going to JDRF, and perhaps due to her editors from JDRF, she may be putting things in a slightly more saccharin-coated light than I think is really necessary; after all, no one needs another book with warnings about the dangers of uncontrolled diabetes, the press covers that part just fine), but in general, I think Mary did an acceptable job about being more more frank about diabetes than most other books out there. "Spontaneity is one of the first of life's pleasures that's lost when diabetes appears." Mary's editors do temper her truth with some "that's the way it has to be" comments which I don't think really adds any value, but as International Chairwoman of JDRF, I guess she has some obligation to cover these bases which a more critical assessment of diabetes (sadly, there aren't many of those more critical assessments of diabetes in print) generally do. However, she does balance things more honestly than most other books do at all. 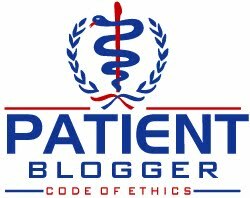 Most books omit all downsides, except for telling patients that their failure to properly manage "their" diabetes could have dire consequences, as if we need any reminders ... I think not! All of this has me looking back to the books available to patients today versus what was around when I was diagnosed with type 1 diabetes back in July 1976 (my biggest concern then was why couldn't this have happened in September, as I already had an older sister with type 1 so the shock value of the diagnosis was a non-event for me, which had both its good and bad points). There weren't many choices back then, save for a few text-book like tomes about diabetes (or at least what was known or believed to be true then), but in retrospect, I'm not convinced what we have today is that much better. There IS more variety, and for children, there's definitely more choices (visit Amazon.com and type "juvenile diabetes" in the search field for books and you'll see what I mean). Today, ad agencies (and apparently, their clients) have decided to go retro. I suppose this really isn't new, only today, I have become that retro market, whereas I certainly wasn't 20 or 30 years ago. In recent years, the retro commercials aimed at baby boomer childhoods are in short supply. As boomers enter their retirement years, they are no longer the primary market for many products advertised. That doesn't mean the boomer market is irrelevant, only that growth for an entire range of products is coming from younger consumers. Consider typical household goods: retired consumers don't use as much laundry detergent or cleaning supplies as younger households with children do. Thus today, the "retro" years seem to be the 1970's, and the target audience is more likely to be very late Boomers and Generation X'ers than it is the core baby boomers who came-of-age during the 1950's and 1960's. We don't yet have a "Wonder Years" for kids of the 1970's, and beyond "That 70's Show" which made Ashton Kutcher famous, but we probably will before too long. Being a Gen X'er myself, the music in some of these commercials surprisingly DOES get my attention (not that I have really come to associate the music with particular brands, but at least I don't change the channel). Author P.S., July 2009: Incidentally, Matthew Sweet and Susanna Hoffs recently covered "Hello, It's Me". I wonder if the recent Tums ad campaign had anything to do with it? Talk about changes in attitudes! 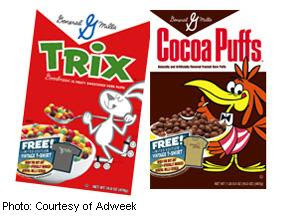 Even the mega-marketer General Mills Corp. is jumping on the 1970's retro bandwagon, having recently introduced re-created cereal boxes for its sugar-coated breakfast cereal products "Trix" and Cocoa Puffs" among others (the boxes are close to the originals, but apparently, by law, they must have contemporary food illustrations ... I'm guessing that is a USDA or FDA mandate) now being distributed through Target stores. Not too long ago, Adweek described the move by stating "What a smart marketing move and a genius way to redefine comfort food at a tough economic time -- by providing comfort kitchen art!" Now, as a child with type 1 diabetes in the 1970's, all of this kind of food was taboo (and frankly, it really wasn't a bad idea to make it taboo for any kid, then, or now, in the family considering the low nutritional value, and high calorie, high sugar content in these foods, but I digress), which means the cereal boxes don't have very much "comfort food" value for me since I almost never ate the stuff. But I DO recall the character Trix Rabbit and Coo Coo Bird, largely because the commercials appeared ad nauseum on any Bugs Bunny or Underdog cartoon reruns I used to watch as a kid. As much as I'm wallowing in this trip down memory lane, there IS a point to all of it. I was diagnosed with type 1 diabetes in 1976, so all of these were songs routinely played on the radio when I was a kid. What about diabetes books for kids in 1976? Well, a thinly-veiled cartoon publication called Mr. Hypo (named not after hypoglycemia, but hypodermic needles) from Bayer's Miles Laboratories (the name that business used to carry) about all the new "friends" people with diabetes had! I didn't think of Mr. Hypo was a friend, but I guess I had some advantage over kids diagnosed in the 1960's or even before then! For anyone who'd like to see the entire booklet, you can have a look HERE. Now, I have to admit, I did not save this little diabetes treasure, but I did find it here on d-blogville under Yay Islets! blog. She wrote about each page separately, so I've captured each post here: intro, pp. 2-3, pp. 4-5, pp. 6-7, pp. 8-9, pp. 10-11, pp. 12-13, pp. 14-15, pp. 16-17, pp. 18-19, pp. 20-21, pp. 22-23, pp. 24-25, pp. 26-27, pp. 28-29, pp. 30-31, and the conclusion. Anyway, this trip down retro-ville has been amusing, but my point is that Mary Tyler Moore's new book is definitely worth a look. The proceeds benefit a great cause, and in spite of my criticisms, I do think it accomplishes much of what she set out to do when she wrote the book. Hopefully, this will make for an interesting read over this Memorial Day weekend! Hey Scott, interesting journey down memory lane, although I wasn't priviledged to have the info that booklet has. I've never read any authors books about D because I've lived it.